Hundreds of local students began organizing Sunday to oppose an impending schedule change at Middleton High School. They plan to take their argument all the way to the school board if they feel they have to. The students signed on in support of a letter written by Adam Jordahl, who is wrapping up his junior year. Jordahl’s letter expresses concern the school did not make an adequate effort to inform its students of a significant change to “All School Resource” periods. Jordahl contends the decision to split those periods roughly in half would cause an array of scheduling problems for students. He writes the change would allow less time for pupils who need to use the periods to study, make up important tests, and do other classwork. The Middleton High School (MHS) Bands will present their series of Spring Concerts on Wednesday, May 8 and Thursday, May 9 at 7:30 pm in the Middleton Performing Arts Center. Wednesday’s Concert will feature performances by the Concert Band and the Wind Ensemble. The Concert Band will present Gliere’s famous Russian Sailor’s Dance and John Phillip Sousa’s King Cotton. The Wind Ensemble on Wednesday night will contrast John Paulson’s ‘Epinicion’; a piece based on an ancient Grecian chant with Eric Whitacre’s ‘Lux Arumque’ – a piece of redemption. Kilimanjaro will be accompanied by a slide presentation of science teacher Joe Spolar’s climb of the peak. Middleton High School proudly presents “The Music Man” Thursday, Friday and Saturday at the Middleton Performing Arts Center, 2100 Bristol Street. All shows begin promptly at 7:30 p.m. Reserved seating can be purchased through www.brownpapertickets.com and is $10 for adults and $8 for seniors and students. Tickets will be sold at the door on performance nights beginning at 6:45 p.m. For more information, please feel free to contact the ticket information line at 829-9770. A Madison woman is in custody after allegedly making threats against West Middleton Elementary School. Andrea Holmes, age 31, was arrested by Dane County Sheriff’s Office deputies Tuesday and is currently awaiting court appearances for disorderly conduct and a harassment restraining order. A correspondence sent to parents and guardians by the school district said Holmes, the parent of a child at the school, made “serious threats” when she became agitated during a phone conversation with West Middleton principal Todd Macklem. Macklem told authorities Holmes made reference to the massacre at Sandy Hook Elementary School in Newtown, Conn.
Dane County deputies and Middleton-Cross Plains Area School District superintendent Don Johnson met at the school to discuss the incident shortly after it occured. After deputies contacted Holmes to discuss her statements, they made a decision to arrest her. More than 200 players participated in the SLAM DUMP 3-on-3 basketball tournament Saturday afternoon at MHS. Senior Joshua Bunting, junior Jed Munson and sophomore Ben Hershberger organized this year's event. This was the third year SLAM DUMP was held. This year's event raised approximately $6,800 for Amor, Fe, y Ezperanza (AFE), an organization dedicated to providing children of the city dump in Tegucigalpa, Honduras with education, food and technical skills. The title means "Love, Faith and Hope" when translated into English. "We had a lot of fund doing this,'' said Hershberger, who also returned to Honduras this past summer along with Munson to build a house for one of the families living in the dump. The idea for a fundraiser began in the summer of 2010 when a group of middle and high school students embarked on a youth missions trip to Honduras. There, they witnessedan impoverished community inhabiting a local landfill. Twenty MHS music students have been invited to participate in the 2013 High School State Honors Project. Each of these students auditioned for an ensemble in the Wisconsin School Music Association (WSMA) State Honors Music Project in February. Twelve MHS band students, five MHS orchestra students and three MHS choir students were selected for one of the honors ensembles. Students selected for the WSMA State Honors Music Project will participate in a three-and-a-half day summer camp in June and will perform in Madison during late October as part of the Wisconsin State Music Conference. The WSMA State Honors Music Project is nationally recognized as one of the finest musical opportunities for young people. Editor's note: Nicholas Taylor is a 10th grader at Middleton High School. Delegates from the Middleton High School Model United Nations club are back in classes after spending four days with more than 600 students from across the Midwest debating international affairs. 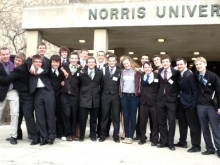 Twenty MHS students descended on Northwestern University in Evanston, Ill., on April 11-14 to participate in the Northwestern University Model UN conference. Model UN conferences allow students to take on the role of international diplomats for the purpose of collaborating with others, learning about foreign relations, and attempting to solve the problems of the world. “The best part of the conference was working with other delegates and sharing different ideas,” sophomore Joey Duff said. A record 13 MHS students qualified for next month’s DECA International Career Development Conference at the end of April in Anaheim, Calif.
Bob Hutchison said it was the most students the school has qualified for the international conference since he took over the DECA program at MHS in 2001. Meanwhile, Madeline Guyette was elected to serve as vice president of chapter development for Wisconsin DECA for the 2013-2014 school year. Her duties include providing resources to help chapters from around the state become strong DECA chapters. She is the second state officer MHS has had under Hutchison. Middleton High School has one of the premier athletic programs in the state. The Cardinal Booster Club aims to keep it that way, no matter how tight the school district’s budgets get. Mardi Gras, the booster club’s annual fundraiser, will take place Saturday from 8 p.m. until midnight at the Marriott, 1313 John Q. Hammons Dr., Middleton. Anjie Harris-Ostrem, one of the event’s organizers, said Mardi Gras serves as both a festive respite from the long winter and an essential yearly fundraiser for 28 different Middleton High School athletic teams. Two years ago the booster club donated $114,000 to MHS programs, but that number was down to $110,000 last year. MHS athletic director Bob Joers said his department’s annual budget remains flat from year to year. As a result, the booster club’s role is growing increasingly important. The Middleton-Cross Plains Area Board of Education on Monday night voted unanimously to move ahead with plans to expand Sunset Ridge Elementary. The current estimated cost for the project is about $1.39 million, but the figure won’t firm up until construction bids come back to the school board for review in the spring. The proposal, which is intended to alleviate overcrowding, calls for a total of four new classrooms, including one for art, one for music, and two for core curriculum. While a successful referendum in 2012 allows the district to exceed levy limits and spend just under $60 million to expand and upgrade Kromrey Middle School in the City of Middleton and Glacier Creek Middle School in the Village of Cross Plains, the Sunset Ridge project in the Town of Middleton will come out of the district’s existing fund balance.